A couple of years ago, I starting forming lists of about 40 things that I wanted to accomplish in that year. Some of them were simple, other's more difficult. This year was my third year making that list, and I have decided to share some of them with you guys today! Read 35 new books. My first year it was 25, last year was 30, so I upped it to 35 this year and specified that they had to be books that I've never read before. Write every day and fill up a whole notebook. I write every single day without a fail, especially now that I have this blog. I now have a small notebook that I use to write here and there when I have time. Grow a flower or some sort of plant and keep it alive. My mom and I have a tendency to kill any plant that we touch. But not for long! I want to keep a flower alive for as long as I can. Keep reading to see my flowers of choice. Make Yoga part of a weekly routine. I kept up with this for a solid month at the beginning of the semester, but I got bored of the routine I was doing and never found myself a new one. Maybe I'll start back up once I'm done with classes! It really made me feel relaxed! Go a day without my phone and computer. I want to go completely technology free one day this summer. Just me and a book or some friends. I just want to test myself to see if I can, since my whole world seems to revolve around technology. Cook or bake at least 10 things that I have pinned. I pin a lot of delicious looking treats and never seem to make them. The recipes just sit on my board for show. I plan to change that and take advantage of the resourceful Pinterest folk who have fantastic ideas! Do a DIY or craft that I have pinned. This is along the same lines as #7! I have some crafts pinned that look super cute and easy and I have yet to do one! I feel like this will be great for when it comes time to decorate my dorm next semester! Re-do my bedroom at home. Even though I live at school for more than half of the year, it's still nice to go home and enjoy the room that I'm staying in. There isn't anything wrong with my current room setup, though I've heard that my family just uses it as a room to store things that clutter their own rooms…I digress, I feel like I've changed a lot since I left for school and that when I go home, the room feels like it belongs to someone else. I want to tweak it a little bit so that I can feel comfortable in the privacy of my own house. Stop being afraid to make that first move. I am terrified of initiating things, whether it be conversations, friendships, relationships, whatever it may be. At some point, I'm going to have to put on my big girl pants and start making the first one. When I think about the amount of things that I miss out on because I wait for people to come to me, well, I just don't like to think about it at all. Here are my dear Tulips that I picked up a few days ago. 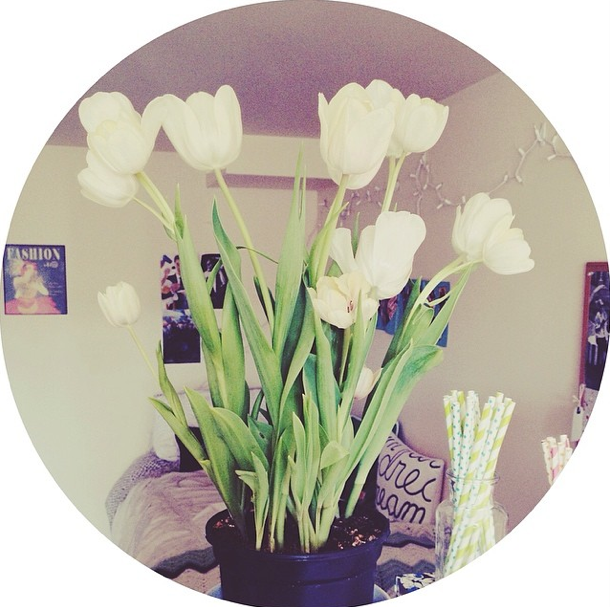 They're supposedly pink tulips, but I swear that they're white. Regardless, they are precious and I love them to pieces. Plus, they smell incredible. What is one thing that you want to accomplish in 2014?